The polls still suggest a close result but, with the Tory campaign in disarray and their supportive press barons suffering a collective nervous breakdown, I’ve started to feel vaguely optimistic that the next BIS employment relations minister will be a talented Labour MP such as Gloria De Piero, Stella Creasy or – if he survives the SNP tsunami – the excellent Ian Murray. And the reported remarks of Labour’s Lord Falconer, that the shadow cabinet has “very, very few” machinery of government changes in mind, has set me thinking about just how long a ‘to do’ list the new BIS minister would find waiting for them on their desk at 1 Victoria Street. Preparing a Bill to legislate as necessary in relation to these and other strands of work. That’s quite a ‘to do’ list for anyone to cram into five days a week, let alone someone who has a second job as a constituency MP. Yet the position of BIS employment relations minister has always been both a junior and a part-time role – the remit of the Parliamentary Under Secretary of State for Employment Relations and Consumer Affairs currently covers, in addition to employment relations: Post Office and postal policy; consumer policy and consumer affairs; competition policy; corporate governance; company law; social enterprise; Insolvency Service, including company investigations; and BIS better regulation, efficiency and reform agenda. So, if Labour are serious about “supporting firms to win the race to the top, not get dragged into a race to the bottom”, perhaps one minor ‘machinery of government’ change they should consider is separating employment relations and consumer affairs, and appointing a Minister of State for Employment Relations. Some of of the above work strands will involve tricky negotiations with HM Treasury, the Ministry of Injustice and other departments, and on ET reform the minister will no doubt need to bang heads together at the CBI and TUC, so it would be handy not to be at the very bottom of the ministerial food chain. And promoting the position to Minister of State level would widen the talent pool from which to select what should be a prominent voice in any Labour government formed after 7 May. 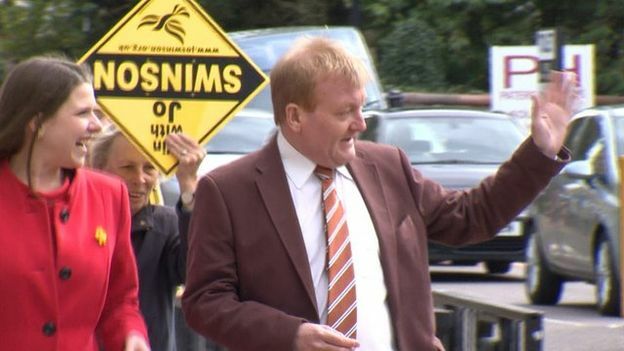 Postscript: As if I hadn’t made the case well enough above, today the following photograph emerged, showing that the current holder of the post is too exhausted from her ministerial duties to notice that her campaign team are holding her placards upside down.